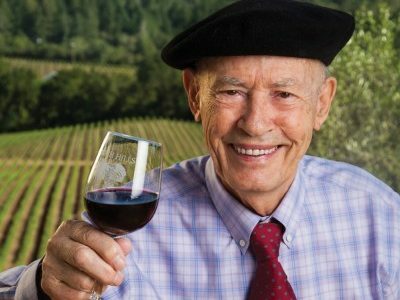 Since the Tasting of Paris in 1976, California wines, especially in Napa Valley, have carved out a prominent place for themselves among the elite wines of the world. Less well-known, but equally outstanding, are the wines from the Santa Cruz Mountains. Grapes in the Santa Cruz Mountains came to be known for their quality by the middle of the nineteenth century. Many wineries sprang up, but succumbed to the ravages of government and nature. Four wineries in the Santa Cruz Mountains have endured. They have gone through disruption, but the land, the structures first built in the late 1800s, and, in some cases, the vines in the vineyards remain. These four California wineries are a testament to human ingenuity, resilience, and the belief that anything is possible. If you drive south on Highway 101 from San Mateo you will see hundreds of signs of companies whose names don’t always offer a clue to their business. They do, however, have one thing in common: Almost all are producers — or ultra- sophisticated users — of high technology. As you switch freeways to go toward the ocean, the landscape changes — the bland three-story office buildings along the flat floor of the valley give way to winding Highway 17 which cuts through the mountains with their towering redwoods before taking you to agricultural Watsonville. Unlike Napa to the north of the San Francisco Bay, this region does not scream viticulture with rows of grapevines rising from the road to the hills beyond. Rather, you will be hard pressed to see any vineyards along the length of the Santa Cruz Mountains, arguably one of the finest wine growing regions in the country. A few miles west of US 101 runs Highway 280, more pastoral in its meanderings between the Santa Cruz Mountains, visible to the west, and the foothills that house the Stanford Linear Accelerator Center to the east. Here you will see quaint houses serving a whimsy or just plain old houses atop a hill for people who enjoy the splendor of solitude. To the west, under the shadow of the hills is a rift valley formed by movements in the San Andreas Fault, which runs along the ridge of the Santa Cruz Mountains and commands a high degree of fearful reverence for its ability to throw the Bay Area into the turmoil of an earthquake. Driving along the highway, you would never guess the technological innovation that has emanated from this valley and touches all parts of the world. Nor are wineries visible from here. But having existed in the same area for several decades, wine and tech are now intertwined. At the same time, both industries tell a story of determination and survival. The Santa Cruz Mountains start north of Half Moon Bay and run south to Watsonville, where the Pajaro River, which empties itself into the Monterey Bay, marks their southern boundary. Part of the Pacific Coast Range, they separate the Peninsula from the Pacific Ocean. At their highest elevations, they measure almost 3,800 feet. Recognized as an American Viticultural Area in 1981, the Santa Cruz Mountains span the three counties of San Mateo, Santa Clara, and Santa Cruz. Estimates of size of this AVA range between 480,000 acres and 322,00 acres. Of these, roughly 1,500 are under grape cultivation, the same acreage as at the turn of the twentieth century. 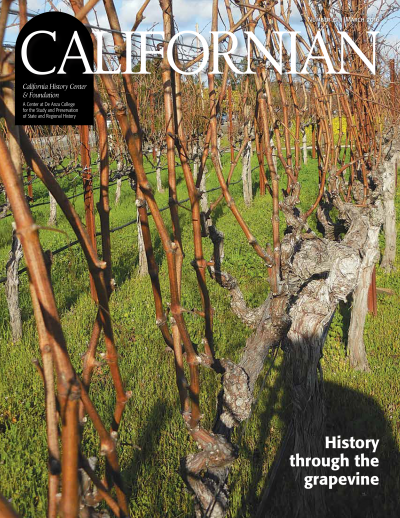 Contrary to popular belief, says wine historian Charles Sullivan, the Spanish missionaries did not come to Alta California armed with vine cuttings that yielded grapes prolifically to make wine. In fact, for many years after the missionaries set themselves up here, wine was brought up from Baja California, as the few cuttings they brought with them did not sur- vive. A small amount was made successfully at Mission Santa Clara in the early nineteenth century; there is no record of successful winemaking at Mission Santa Cruz as late as the first quarter of the century. Wine, however, was produced in some missions, starting in the late 1700s. But by the middle of the nineteenth century, these mountains had begun to be recognized for their potential to grow good grapes, In 1853 Lyman J. Burrell, a native of Massachusetts, had moved to this area and begun shortly after the cultivation of fruit, including grapes. In 1859, his grapes won a premium at the county fair. A few years later, the brothers John and George Jarvis bought land on the mountains and planted their own grapes. Soon they began to produce wine and were followed by others. The wine produced here had in- tense flavors, as much due to the talents of the winemakers as to the terroir, that combination of soil, weather, available tools, and skill that gives wine its distinctive flavor. So good was the wine produced by these individuals and those who followed that by the turn of the century the ridge of these mountains had earned the nomenclature Chaine d’Or or chain of gold for the fineness of the grapes they yielded. The secret behind the flavors lay in the geography of the Santa Cruz Mountains. The soil was poor and the hillsides could hold no water. Cold winters followed warm summers in which fog rolled in from the ocean, before the sun burnt it off in the morning. This cooling effect resulted in a longer growing period, imbuing the fruit with flavor that is lost if it ripens too quickly in hot weather. The steep hillsides would have made ploughing difficult, if not impossible. In truth, apart from fruit, these mountains would have supported little agriculture. Along with geography come the events of history and their profound outcomes. Here, some groups gained at the expense of others. The setting up of the missions and the disease and violence that accompanied later incursions decimated the populations of First Nations people, such as the Ohlone, who had lived and thrived on these lands for eons. The discovery of gold in 1848 followed by statehood in 1850 opened a floodgate through which rushed all manner of people seeking better lives. Many came from Europe, in political and social turmoil during these decades — Italians, Germans, French — bringing with them their own traditions and ways of life. At the same time France, a half a world away, was once again in the throes of political change. In February 1848, a revolt among the people led to the dethronement of Emperor Louis Philippe and the formation of a republic. In June, after workers’ riots shook Paris, Louis Napoleon, nephew of Napoleon Bonaparte I, was elected to the National Constituent Assembly. He returned from exile in England and in December he became president of the Second Republic. Three years later, in December 1851, he staged a coup d’etat and in 1852, he proclaimed himself Emperor Napoleon III. Meanwhile, the turmoil in other parts of Europe also opened the floodgates of emigration. In 1848, several European states tried to embrace liberal reforms. Although success was limited, these attempts did lead to changes in the form of government. Italy completed its unification in 1861, adopted a more progressive constitution, and accepted the king of Sardinia as the king of Italy. Germany followed a similar pattern of liberalism and unification. From 1840 to 1880, Germans were the largest group of immigrants to the U.S.
All of this political activity in Europe led to upheaval in the lives of those who found themselves on the wrong side of the events. Fortunately for them, North America beckoned; many saw the signals and set sail. Some did not stay at the first port of call on the eastern seaboard, but continued westward. The newly announced state of California offered gold and vast lands. Toward that desired destination they pointed their feet. Jean Narcisse Aubry was one of those who fled France and made his way via the gold mines of Alaska to the Santa Cruz Mountains near Saratoga. By 1859, he had begun to settle down. It was easy to acquire land: The federal and state governments granted acreage to new immigrants to promote development, asking for little in return. The homesteaders cleared the land of trees, such as oak and redwood, and built a home for themselves and their families with the wood from these trees, using or selling the excess as firewood. They removed the chaparral undergrowth to grow fruit — prunes, apples, and apricots, and raised livestock. It was grueling work but it paid off. Those, like Aubry, who had winemaking in their background established vineyards and imprinted the landscape and economy of the state with their skills. Wine was a part of their lives – to be drunk at meal times. They had come from temperate lands into a climate that matched what they had left behind. To that extent their new homes suited them. But the loss of community in the land of their birth and the many challenges that the frontier state necessarily presented must have taken a greater force of will to create a rhythm of life. In The Saratoga Story (1962), author R.V. Garrod writes about the families that made their lives in the Congress Springs area of the Santa Cruz Mountains. Covering the period before Prohibition, it is a chronicle of births, deaths, and marriages, of crops planted and harvested, of new entrants into the area. One person sailed from Western Europe and made this place home doing what all immigrants do to survive in their new environs – building a neighborhood. He sent for his family – siblings, parents, uncles, and aunts. Garrod narrates simple events, giving a sense of a community not threatened by external factors, but settling down. Post Prohibition, the children continued to work in the family business or went to war for the country, showing once again a population growing roots. The rhythms of life were punctuated by tragedies. In 1942, Robert Pourroy, while working in his father’s business, fell into a vat two-thirds full of crushed grapes after being overcome by fumes from the fermenting wine. He was the son of Eloi and nephew of Pierre, the two brothers who built a winery on these mountains in Saratoga. And in 1945, Pfc. Virgil Picchetti, grandson of the founder of Picchetti Winery on Montebello Road, died in Germany as the Second World War ended. Similar to Napa Valley, many who came here had made their fortunes elsewhere. Alfred Tubbs of Chateau Montelena and Gustave Niebaum of Inglenook in the Napa Valley had achieved financial success in cordage and trading respectively. In addition to drawing those who risked their all for a better life, the mountains of Santa Cruz drew physicians and later, because of proximity to Stanford, scientists who, too, had proved themselves in their professions before the challenges of winemaking attracted them. Although the Bay Area had seen technical creations as early as the mid-nineteenth century, it was in the mid-1950s that the semiconductor industry made its home here. The earliest creators of the transistor nicknamed this area Silicon Valley. But the inventions in technology were not confined to engineering. Over time electronics found its use in defense, communications, and medicine, leading to remarkable discoveries and treatments. Most important for the wine industry, these developments generated an enormous amount of wealth that allowed the innovators to try their hands at other things. And what better aspiration than to press wine, at once an artistic endeavor that brings people together and a business that can outlive the founder, as in Europe. And there lies the rub. At the conclusion of his work Like Modern Edens: Winegrowing in Santa Clara Valley and Santa Cruz Mountains 1798-1981, Sullivan says that the growth of the wine industry has been different in the North Bay because the pioneers in the Santa Cruz Mountains were too individualistic to care about the development of a wine personality. Looking at the two wine regions of Napa and the Santa Cruz Mountains, I wonder if the difference is that Napa vintners preserved the rural nature of their region. In doing so, they were able to build a brand, whereas the people of science who came to Silicon Valley after World War II were soloists, professionals who couldn’t stop the march of urbanization that technological achievement unleashed and figured that the only way to survive was by distinguishing their product from that of the competition. Succeeding in the tech industry, they made their wines as they made their integrated chips or built their medical practices. By intellectual vigor. and Savannah-Chanelle, are a testament to human ingenuity, resilience, and the belief that anything is possible. “When I was a novice here in the early 1960s, the rhythm of life was very monastic,” said Brother Dan Peterson, archivist at Santa Clara University Li- brary. “The bell would ring at 5 in the morning and we would get up and have morning prayer, private meditation for an hour, and then Mass. We were learning different forms of mental prayer. After breakfast, we would have our class time, work periods. Each novice broth- er was assigned jobs – kitchen jobs, housekeeping chores, mopping floors, cleaning bathrooms. My job was assisting in the library. The rigor of a monastic life was hardly surprising given that Mission Santa Clara was established in 1777 by the Franciscans, an extremely austere sect of Catholics that takes a vow of poverty. By the beginning of the nineteenth century Spanish governors in the territory began to secularize the missions and by 1851, Mission Santa Clara had only one Franciscan left, and he was preparing to leave the mission for the Gold Country. The mission property fell into disrepair and squatters took over chunks of land and portions of the building. Bishop Joseph Alemany of Monterey gave the Mission Santa Clara to Father Giovanni Nobili, a Jesuit priest. The Jesuits had escaped to this part of California after being expelled from the Spanish territories in Mexico in 1767, following a similar banishment from the Spanish Empire and from the pope. Handed Mission Santa Clara in 1851, the Jesuits were told to start a college. They established Santa Clara College the same year and became educators. Almost from the very beginning, winemaking was part of Santa Clara College, similar to the tradition of Catholic seminaries, where wine was used by the priests both for meals and for mass. The university was home to vineyards. Additionally, in 1871, the Jesuits at the college bought 160 acres of land in Cupertino on which they planted grapes for wine production. In 1875 the brothers established Villa Maria, a winery and retreat. Later, Vincenzo Picchetti, an Italian immigrant who established an eponymous winery on the Montebello Ridge, would work in the orchards here. Soon after founding, Santa Clara University started receiving novices for the order, so they instituted a program for their formation and training. The novices shared living space at the college with faculty members, and soon it became ob- vious that the two groups needed separation. The University searched for land. In 1886, it bought a lot on a hill in Los Gatos and established an entity distinct from the University, namely the Sacred Heart Novitiate. With the completion of a new building in 1888, the novitiate program started there in July of that year. At this time, Brother Constantine Valducci, the Novitiate’s first vintner who had learned his craft in his homeland of Italy, built a small wooden winery in which he began pressing grapes, producing the first vintage the same year. The following year, 1889, the Novitiate earned $80.50 from selling 322 gallons of wine to St. Ignatius College in San Francisco. Three years later, the vineyards yielded 9,800 gallons of wine. As output increased, in no small part fueled by free labor from the seminarians, the Novitiate sold to establishments outside the State. It made sweet wines, which were labeled differently for use at the table and at the altar. Now the brothers replaced the old wooden winery with a concrete structure — a three-story, gravity-flow winery — which, although altered, survives. Over the years, the Jesuits bought parcels of land that lay adjacent to the original property and named it St. Joseph’s Hill, all part of the Santa Cruz Mountain range. As production grew, Novitiate took out trees and planted vineyards. Because much of the wine made was sacramental, Prohibition did not hurt the winery. But winds of change blew in the 1960s that led to the eventual closure of Novitiate. The Second Vatican Council of 1962 to 1965 revised wine usage for Mass. By dropping the ritual that required wine to be poured in the chalice for cleansing after consecration, the church cut by half the amount of wine used at Mass. Further, the Church did away with the obligation to label sacramental wines. Consequently, diverse wines could be used at the altar. And the last blow — tastes in wine evolved and consumers moved away from the sugary toward the dry. If these changes left Novitiate reeling, a dramatic drop in the number of young men who pledged themselves to the cloth after the Second Vatican Council made matters worse. From 30 to 40 novices in the early 1960s the number dropped to between 10 and 12. The location of the vineyards on the slopes of mountains where no machinery could go meant that everything was done by hand. Novitiate had not the free labor to make the business work. In 1963, the Jesuits opened an additional seminary in Santa Barbara and over the next few years moved all operations to the new facility. In 1992 Culver City became home to a new seminary and remains so to this day. The business continued with the use of farmworkers in offsite vineyards, but by 1985 the Novitiate management realized that running the operation was not feasible. In 1986 the Jesuits closed the winery and surrendered the bond to the state. The Jesuits decided to lease the buildings. The years saw many leases signed and not renewed. In 1984, the Jesuits had sold 170 acres to the Mid-peninsula Regional Open Space District and had also granted a conservation easement to this district and the City of Los Gatos on 94 acres to prevent development. The Jesuits retain two parcels totaling 165 acres. In 1997, Rob and Diana Jensen leased one cellar from the California Province of the Jesuits. Like so many who had come before them from triumphs in other fields, the Jensens left their high-tech careers and made wine in their garage in 1993, naming their endeavor Testarossa. As their success grew, they leased more and more, including the old three-story winery and the warehouse from the Jesuits. Currently they make 30,000 cases of wine in a year. In reviving the property and building a new business, Testarossa has embraced the old and the new. Driving up the winding road from urbane downtown Los Gatos, I was surprised to see the wooded, winding pathway with California buckeye and oak leading up to the winery, so well hidden from the bustle of commerce below. I parked in the shadow of a high wall, reminiscent of an old Italian castle but built in the 1940s of stone quarried locally. Taking a long flight of steps, I went across an inviting patio, with tables and chairs under the shade of giant sycamores, an old cork tree, to a cave that leads to the tasting room. Here was a thriving business. In 1872, Vincenzo Picchetti came to California from Northern Italy and tended orchards as a farm hand before he went to work for the Jesuits at Villa Maria, the winery and retreat of Santa Clara College. It was a job he knew something about, as his parents had owned a winery in their village in Northern Piedmont. A couple of years later his brother, Secondo, set sail for the New World. In 1877, encouraged by the Jesuit brothers of Villa Maria, the Picchetti brothers bought 160 acres of land in the Santa Cruz Mountains on the ridge that soon bore the name Montebello or beautiful mountain. The story of the Picchettis is similar to that of others who came here with aspirations and a determination to succeed. A year after they bought their piece of real estate, they built a small house that can still be seen on the grounds. They cleared the land and planted vineyards and fruit trees. In 1882, Vincenzo went back to Italy and came back with his bride, Teresa Cicoletti, a woman eleven years his junior. A couple of years later, Vincenzo bought out Secondo’s interest in the property and in 1886 he built a large house, which subsequently boarded four generations of Picchettis. In later years, as the family grew, the Picchettis added more living space. Perhaps the most fascinating feature of these additions is the presence of an upstairs bathroom. In 1893, they had an inside bathroom. Nor was the bathroom a sign of firsts for the Picchettis. They were the first to bring telephone lines up to the ridge. When Josephine, Vincenzo’s daughter-in-law came to the U.S. in 1921, the lines were already up. The original house remained a residence for workers, who had earlier shared the space with the owners. Over time as needs grew, new buildings popped up on the property. These included a fermenting house, a press house, a black- smith room, which now is used as a bottling room, a stable, a garage, and a wash house. The latter contained an oven for baking bread and a stove for processing fruit. Another area held sheds with drying racks for prunes and apricots. It was a hard life; the day started at dawn and ended around 9 o’ clock. All the work, including making salami, was done by hand. When the Picchetti children and the few others on the hill reached school age, the Montebello school was built in 1892. Vincenzo supplied wood for the schoolhouse, said Mary Picchetti, his great-granddaughter. Four generations of Picchettis went to school here. But the most important building, for the purpose of this piece, was the winery that went up in 1896. With this, Vin- cenzo changed his status from grape grower to winemaker. So far, grapes had been one of several fruits growing on the lands, along with prunes, apricots, walnuts, pears. Now he hired Italian workers to pick the many varieties of grapes – zinfandel, petite sirah, mataro, carignane, and palomino. If winemaking always has challenges, the Picchettis faced their fair share of them. These difficulties were not peculiar to the Picchettis; rather they were endemic to the industry. But phylloxera, World War I, and Prohibition did not make winemaking a smooth endeavor for the family. Indeed, said Josephine Picchetti, in an interview with Shirley Chappell and Lorraine Bress (1975) that the family never recovered from Prohibition. Although the winery was not officially closed until 1973, wine from Picchetti graphes had ceased to be made a decade earlier. In 1976, the Picchetti family sold 108 acres of the ranch to the Midpeninsula Regional Park District, which is the current owner. Using public funds, the park district has done major repairs and seismic retrofitting. For 16 years, wine was produced there under the name Sunrise Winery. In 1998, Leslie Pantling leased the property from the park district, brought in new equipment, and restarted wine making, which had had a checkered history after the Picchettis gave up their land. The old brick winery is the new tasting room. An intricately carved cask dating back to 1904 sits in a corner of the room. Picchetti Winery makes 9,000 cases of wine. As you stroll the grounds you will see the old aviary, still intact, which housed birds till the Picchettis sold the ranch. They introduced peacocks to the ranch and kept canaries as well. A newer birdhouse shelters golden pheasants, resplendent in their colorful plumage, reminding the visitor of the Picchetti love of birds and their attempts to settle in their new home. The climb up Montebello Road is rapid, past the Stevens Creek Reservoir and the limestone quarry. Bends appear suddenly in the dappled afternoon light. I was tempted to note the varieties of trees along the sides, so dense in places that the darkness surprised me. Maybe the mountain to my left blocked the sun. A quick view through a small clearing of the expansive valley hundreds of feet below helped me focus my attention on the asphalt ahead. I was a first time traveler up this curvaceous drive and I was eager to reach my destination. After the next hairpin bend a sign appeared suddenly. It was Jimsomare — the lowest of the estates on the mountain that Ridge farms for grapes — that Pierre Klein, a German immigrant, had bought in 1888, after years in the hospitality business in San Francisco. It went by so fast, I barely had time to recall the salient points of its history. Then up several hundred feet more and I pulled into the driveway of the ranch that maintains the tasting room. Picnic tables amid fall flowers and a sign warning against rattlesnakes made me both chuckle and glance warily at the gravel under my feet. Once again, I felt the pull of the sprawling Silicon Valley below, this time without the fear of tum- bling several hundred feet, but instead I entered the spacious wooden interior of the building that was built by John Torre, an Italian immigrant and cattle rancher, who bought one hundred acres on the Montebello Ridge in 1890 and completed this barn over a cellar two years later to make and store wine. A few steps from this barn is the original Torre house, in which the family lived for several years and is now used as an information technology center. The world-class wines apart, the history of Ridge Vine- yards is unlike that of the other wineries on this mountain. It is not one piece of property that had its buyers and sellers making their way through the ups and downs of pests and war from the nineteenth, through the twentieth and into the present century. Rather, it is a tale of different families coming to a hill in search of a place to farm and live that happened upon an exceptional terroir to grow grapes for wines. Eventually, through the management skills of a group of scientists in the mid-twentieth century, the defunct properties came together as a thriving business. he had set up the Montebello Wine Company to bottle and distribute his wine. Only a dirt track at this time. During his commute one day, his carriage went off the road, causing him a leg injury that required an amputation. Refusing that line of treatment, he succumbed to gangrene in 1912. The business went to his nephew of the same name. Perched on the hill, finding my bearings proved hard, but down one of those winding roads was a thoroughfare that led to another lot — seventy-five acres that Charles Rousten bought in 1903. This parcel lies between the Torre and the Klein/Jimsomare estates. Rousten had worked in the wine business in the Valley; on his own property, he planted wine grapes and constructed a winery. At his death, his property passed to his son, who survived Prohibition only to close the winery in the 1950s, when federal reporting rules over- whelmed him. He switched to orchards and cattle ranching. The afflictions that ground the wine industry to a halt affected the owners of land on Montebello as well. Holding on as long as they could, they gave in to a series of assaults on winemaking by pests and humans. In 1920 the Torre Winery, where the current tasting room is located, closed. The property changed hands a few times until in the late 1940s a theologian, William Short, bought it and planted cabernet sauvignon. These vines are extant. In 1959, a group of scientists at the Stanford Research Institute searched for a parcel of land to buy. Hewitt Crane, Charles Rosen, and David Bennion were close friends at the lab where they were building a magnetic logic computer. Howard Zeidler, who was the head of the lab, also became part of the group, though he later left. They acquired 80 acres of land for $48,000. The seller was William Short, the man who owned the Torre ranch. After the ranch became theirs, the SRI scientists worked only on weekends, as they still had their jobs at the lab. Even so, the task was laborious, as Foothill Expressway and High- way 280 had not yet been constructed. That year they made their first vintage, entirely from hand-picked grapes. It took them two years to think of their property as a commercial winery; so far it had merely been an investment in land. Meanwhile in another part of the world, Paul Draper, a Stanford graduate in philosophy with an emphasis on value theory, had been trying his hand at different things, among them wine making in Chile. He had known about Bennion’s work on the mountain for a while before the two met in 1968. A year later, Draper closed operations in Chile and started working for Ridge. The partners had purchased the Perrone winery on the top of the hill the year before Draper joined them and were in the process of putting on a new roof. Draper had his work cut out for him, being tasked with moving operations from the Torre to the Perrone winery. In 1971, he became winemaker. Before winemaking moved to the Perrone estate, wine was made in the Torre barn. In the early years of ownership by the SRI group, there was no tasting room; wine was poured under the eaves on wet days and in the shade of a large walnut tree in the summer. Unstructured, a true labor of love. Over time, the winery added vineyards through long- term leases — Jimsomare followed by Rousten. The different heights of the original four properties and the microclimates make for a range of flavors. A windy road, a sharp turn, and a steep road through the towering redwoods takes you to the site of a winery established more than a century ago. It is the familiar immigrant story. Pierre Pourroy left his French homeland and landed in New York in 1887. After spending some time there, he arrived in California and after working at many odd jobs met Jean Narcisse Aubry (see above), a fellow Frenchman who several decades ago had made the Santa Cruz Mountains around Saratoga his home. Pourroy worked for Aubry and fell in love with his daughter Marie, whom he married in 1891, an act that must have made him feel more grounded in his adopted country. A couple of years later his brother, Eloi, joined him from France and soon found himself a wife. The two couples bought 80 acres of land from another Frenchman, Adrien Bonnet, whom life had also steered into San Francisco. As often happens among family who share property, the two brothers split their holdings and went their separate ways, acquiring new lands and planting fruit trees and grapes. Both raised large families in homes they built on the property. Because they came from France, wine was part of the daily ritual of meal times. In 1910, Pierre planted the first acre of zinfandel grapes, followed over the next few years by cabernet franc and carignane. The zinfandel vines from the time remain. But like others at the time, the Pourroys faced challenges posed by nature and government and their wine business suffered. Life didn’t stop, however, and in the 1920s they built their house, Monmartre, which looks down on the valley below. In the early 1970s, Victor Erickson, an engineer who had set up his own metal products company in San Jose, bought the house and adjoining vineyards directly from the family. 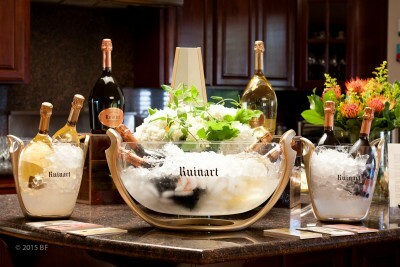 Although he developed a good social relationship with the Pourroys, he raised vegetables, as he knew little about wine. One day, Dan and Robin Gehrs came by and inquired what he was doing in Monmartre. Neither party knew much about the other: Erickson, that a neighbor was looking after the vineyards; the Gehrs, that Erickson was the new owner of the property. A relationship developed that led to the renewal of wine operations and the bonding of the Congress Springs Winery. After the usual initial struggle, the winery thrived, turning a profit by the mid-1980s. Over time the two part- ners developed divergent visions and the property was sold to a business with interests in agriculture but not in wine. The business petered out and soon it was on the market again. The current owners, Kellie and Michael Ballard bought this winery in 1996, after it had changed hands a few times, naming it after their daughters. They planted pinot vines with the goal to produce stellar pinot noir. The old Pierre Pourroy winery is now the tasting room. I have bromeliads and some tropical flowers in my front yard and yes, they attract insects and frogs! I have a small ecosystem going on. 🙂 Beautiful photos!